When I first saw this title I too believed it was a graphic novel, but I'd already heard from others that it was a 'normal' book instead. That's fine as well, just a warning that this is NOT a graphic novel. I'm not familiar with the Winterworld series, this book was my introduction. I'm however a big fan of Dystopian novels and this seemed to be one of those. And it is in fact a good Dystopian novel. The world is frozen over and only the law of the strongest applies. Scully's life is forced into new ways after a tragedy strikes. It dark and brutal (sometimes perhaps a bit too much so), but it really fits the story. It made me interested in reading the graphic novels. I think it probably works great as a prequel novella for fans of the series. 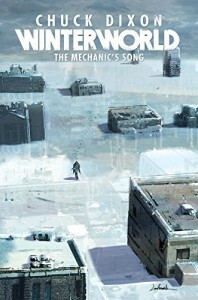 The Mechanics song is the first book in the Winterworld series. It's also a prequel novella to the graphic novel series.